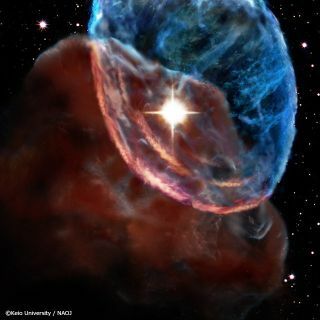 Artist's conception of shockwaves propagating in the supernova remnant W44. Scientists have captured the blast from a supernova 10,000 light-years away in a cosmic speed trap, clocking the shockwave from the dead star's explosive end at speeds of nearly 8 miles per second. The new measurements of the supernova remnant W44 not only revealed how fast the shockwave is going, but also how much energy is associated with it, researchers with the National Astronomical Observatory of Japan explained in a statement. Observations like this will allow scientists to figure out how supernovas shape their surrounding environment, they added. "It also emits kinetic energy into interstellar space. 'Galactic winds' blasting out a large amount of gas are often observed in galaxies where explosively active star formations take place. The energy source ... is also thought to be many supernova explosions." Eight miles a second is nearly 13 kilometers an hour, the equivalent of 28,800 mph (46,440 km/h). For context, the supernova shockwave is traveling slightly slower than the escape velocity of NASA's New Horizons spacecraft when it launched toward for Pluto from Earth. That spacecraft was clocked at 36,000 mph (almost 58,000 km/h), which set a record in January 2006 for the fastest Earth departure. Supernovas take place when a large star, at least eight times the size of the sun, runs out of elements to fuse for energy and collapses upon itself. This process sends out a blast of material and energy into the immediate area. The deaths of these gigantic stars trigger all sorts of secondary effects. For example, they are the primary source for the universe's heavy elements. There is, however, little understanding of the speed and energy associated with a supernova shockwave, observatory officials said. Telescopes are designed to hone in on small areas of the sky, but a supernova requires observations across a wide area. "Wide area observations with the existing equipment require quite long observation times," NAOJ officials said. "Therefore, observations of interstellar gas influenced by a supernova shockwave have been limited to a narrow area." Research team members have studied W44 — which is located in the constellation Aquila — since the late 1990s. In the most recent study, they used the 45-meter telescope at NAOJ's Nobeyama Radio Observatory in Japan, as well as the 10-meter Atacama Submillimeter Telescope Experiment in Chile. NAOJ describes ASTE as a precursor for the recently completed Atacama Large Millimeter/submillimeter Array in Chile, which is designed to (among other uses) penetrate the dusty areas around young solar systems. W44's shockwave is butting against a giant molecular cloud that is about 300,000 times more massive than the sun. The researchers examined molecular spectrum lines in the gas that have a "wide velocity width", which they interpret as evidence that the gas is being pushed by the shockwave. The new work also uncovered the "shocked gas" expanding as the shockwave hits. The shockwave's kinetic energy greatly exceeds what is produced by the sun, observatory officials said. Observations also revealed molecular gas careening at a speed of more than 62 miles (100 km) a second in regions with very strong shockwaves, although the exact origins of this phenomenon aren't quite understood. The team plans to further study shocked gases around other supernovas. The results are published in the Aug. 20 issue of the Astrophysical Journal.